To round off this series on kungfu in movies, we have Northern Opera Kungfu master Jackie Chan in a humorous clip with Indian actress Mallika Sherawat getting caught in a mouse glue making machine in the 2005 movie The Myth. 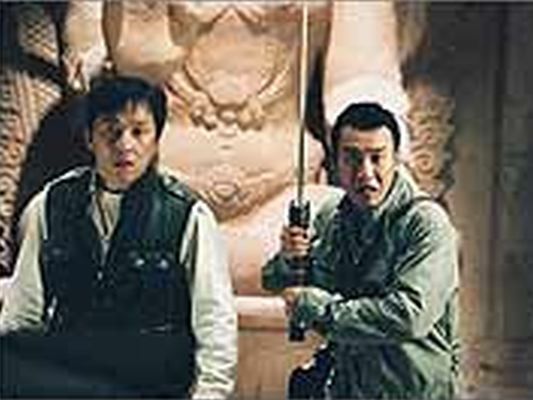 Directed by Stanley Tong, the action exemplifies the innovative use of props as martial and comedic devices. To sum up, kung fu can be used not only to destroy but also to create, which Jackie Chan has done so ably in the realm of wholesome entertainment for the past 30 years. Rumble in the Bronx (1995) catapulted Jackie Chan and director Stanley Tong into the attention of Western cinema goers and movie makers. Jackie had some fifteen years earlier tried his luck in Hollywood with minor roles in Canonball Run I & II but had garnered little public interest then. Rumble in the Bronx, breathlessly replete with action and comedy from start to finish, finally earned Jackie his international stripes. In this clip, Jackie takes on a bunch of bikies in their clubhouse after they have roughed up his relatives. Related Post: Jackie Chan: Police Story (1985). Jackie Chan made his directorial debut in this 1985 standout hit, Police Story, in which he plays a cop pitted against drug dealers. 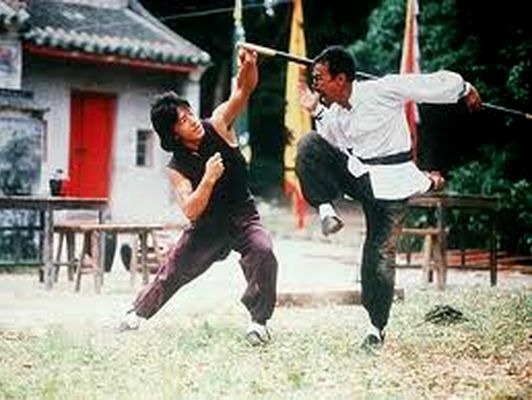 This film, which Jackie considers as his best action film, won the Best Film award in the 1986 Hong Kong Film Awards. 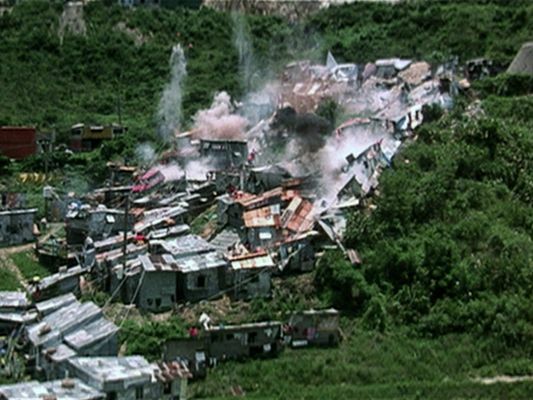 Memorable action scenes include a car chase through a shanty town as shown in this clip. Police Story spawned a total of five sequels over almost 20 years from 1985 to 2004. In the same year Snake in the Eagle's Shadow was released, Jackie Chan had an even bigger box office hit in Drunken Master, a semi-sequel with the same director and screen Sifu. 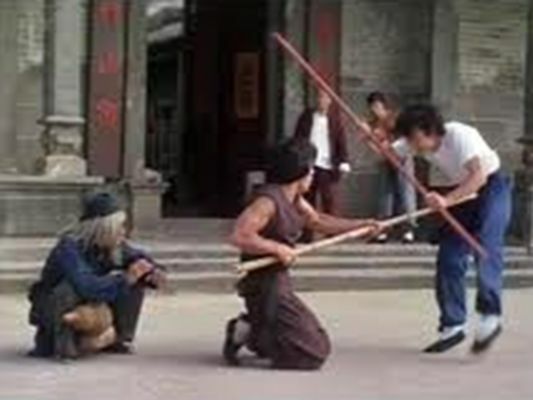 In this clip, Jackie demonstrates exceptional dexterity and comedic action in a fight with a stick wielding kung fu master. On a martial arts note, though Jackie was playing Wong Fei Hung, a Hung Gar master, the kung fu shown in this and the previous post, whether 'Snake' or 'Drunken' kung fu were said to be synthesized from various martial arts, more Northern than Southern. This makes sense as both Jackie Chan and the director Yuen Woo Ping are both graduates of the Peking Opera School. Though not normally thought of as a kungfu master, Jackie Chan certainly qualifies to be one having trained at the renowned Peking Opera School (traditional Opera schools were repositories of various arts, including martial arts) and demonstrating his peerless action skills on screen. Jackie has never publicly revealed what kung fu he learnt except they were a mixture of Northern and Southern styles taught by various teachers at the opera school. Regardless, his portfolio of breathtaking stunt work speaks volumes of his kung fu. Jackie's breakthrough movie was Snake in the Eagle's Shadow, a 1978 martial arts comedy which is also notable for being the directorial debut of Yuen Woo Ping who later action choreographed Western hits such as The Matrix and Kill Bill. 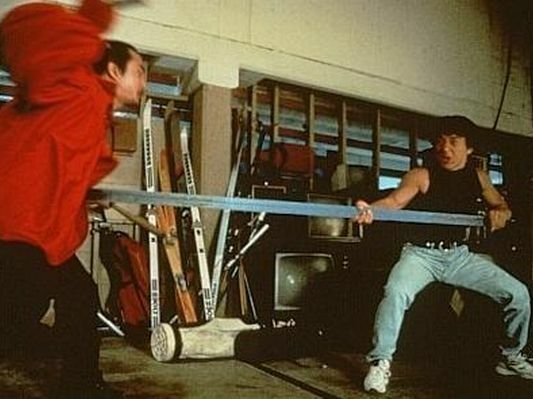 The screen Sifu to Jackie was played by Yuen's father Yuen Siu Tien, who himself was a opera school graduate. Jackie Chan was 24 when this movie was released. This clip is a compilation of training exercises from the movie, many of them adapted from real kung fu practices. As you can see, old school training is extremely arduous. The background music is not too good, turn down the volume as the visuals are interesting enough on their own. Grandmaster Ip Chun appeared in his second movie, The Legend is Born, 34 years later in 2010 when he was 84. Still remarkably spritely, he plays Leung Bik, one of his father's Wing Chun instructors. In the clip, Ip Man, played by Dennis To, stumbles into a Chinese herbal shop, run by Leung Bik and is duly tested. Some nice moves on show here, though not all of them are Wing Chun, especially when Ip Chun's stunt double starts spinning full circles. A nice touch is the use of a pressure point defence by Ip Chun when faced with a wrestling like throw. The dialog is Cantonese with English subtitles, the audio is a bit muted, so you might have to turn up the volume a bit. In probably his first movie apperance, Hong Kong Wing Chun Grandmaster Ip Chun, son of Yip Man, plays his father and mentor to Bruce Lee. Ip Chun was 52 when he made this 1976 movie, a semi-biography of Bruce Lee with Taiwanese actor Bruce Li playing the titular role. 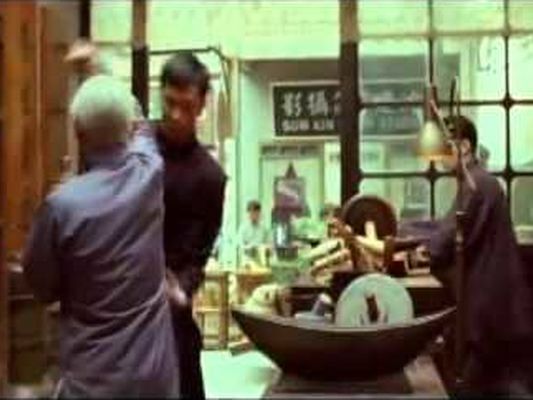 No spectacular fisticuffs here in this English dubbed clip, but note the high on-guard hand position used by Ip Chun in his spar with the on-screen Bruce Lee. According to Wing Chun old-timers, this is the traditional Wing Chun guard position, which in modern times is lowered to a riskier "asking hands" version (see next post). Okay, we'll leave Silat and move on to something lighter: martial arts in movies and television. 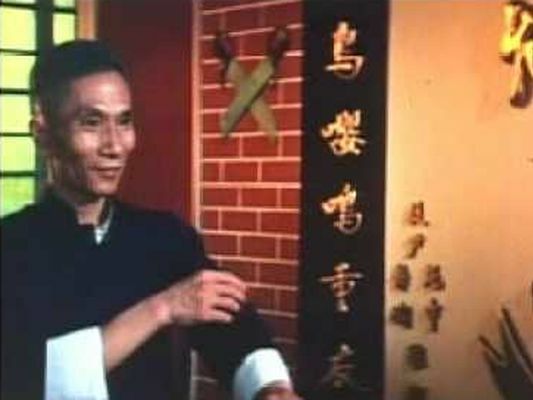 First off, we have a reel version of a Leitai match-up between Wing Chun Grandmaster Leung Bik, the teacher of Yip Man, and a Piguaquan (Chopping Fist) trained opponent. This 2007 Hong Kong TV production titled Wing Chun stars Nicholas Tse as Leung Bik and Sammy Hung, son of Sammo Hung, as the Piguaquan protagonist. Nicholas studied Wing Chun under Ou Yang Jian, a student of Wong Shun Leong who in turn studied under Yip Man. That would make him playing his Wing Chun great great grandmaster. Despite being made for TV, the fight scene looks a bit more substantial than many similar big screen fantasy offerings. Here's another National Geographic documentary on Silat: Inside Silat, featuring Silat Senjata Lapan (Eight Weapon Silat) with Ed Chard cast as the Westerner exploring the exotic world of Malay Silat. This three clip post covers Tekpi, the Malay Sai or Trident. The versatile Tekpi can be used for poking, hitting, stabbing and hooking. Watch out for how the Tekpi prongs are utilized in combat. The narration is in a mix of Malay and English. 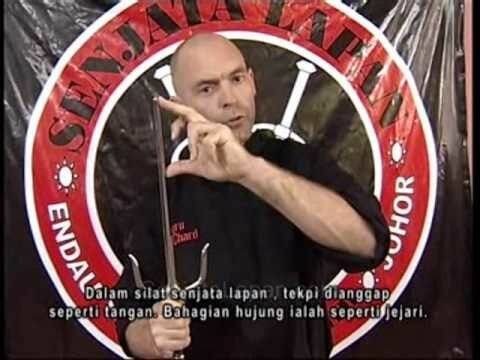 Continuing from the previous post on Parts 1 and 2 of Joel Champ's Silat quest, this post covers Parts 3 and 4 where Joel gets to train in two of Silat's most exotic weapons: the Kerambit (Hook Dagger) and the Cindai (Scarf). Parts 5 and 6 are not shown here as instead of Silat Gayong, the documentary switches to Silat Olahraga, the sports version of Silat - you can click on the links to see them on YouTube. Click picture to view videos. Until recently, the martial art of Silat has been shrouded in mystery - martial artists of other styles who came across this art heard it is lethal and effective but have faint idea what Silat constitutes. Thanks to modern media and persistent researchers from the West, the secrets of Silat are now slowly being revealed. As a finale to our special series on Silat, we present a fascinating four part National Geographic documentary, Fight Masters, which shows American Silat practitioner Joel Champ as travels to Malaysia to learn the art of Seni Silat Gayong (The Art of Power Silat). In these first two clips, Joel Champ lands in Malaysia and is initiated to the local chapter of Silat Gayong in a trial by fire and later learns a deadly Silat locking technique. We have more interesting Silat techniques from Guru Alvin Guinanao of Satria Fighting Arts (or SFA, a rebrand of the Indonesian martial art of Pencak Silat) including defenses against MMA-styled shoot takedowns. Guru Guinanao learnt his craft from Pendekar Pendekar Steven Benitez. 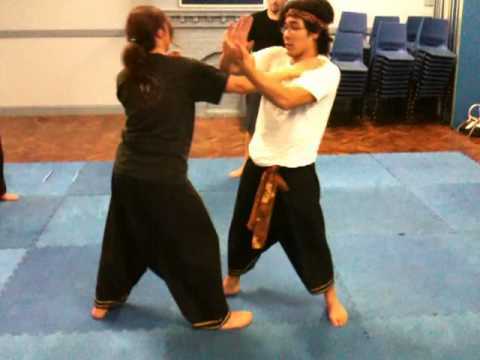 The term Pukulan in the title of the videos translates to 'Hitting' one of the elements of Silat, others may include takedowns, locks, forms, weapons etc. This four part video begins leisurely but picks up speed towards the latter half with some excellent ground fighting on tap. How can the graceful moves of Silat be applied in combat? These four clips hints at how the ground hugging techniques of Silat Harimau (Tiger Silat) can be applied against "shoot" take-downs popularly seen in MMA and UFC fighting. The audio is muted and some sections of the clips are a bit slow, but do watch all four and you should get an idea how the aesthetics of Silat is underpinned by solid combat applications. The instructor is Alvin Guinanao of Satria Fighting Arts. For those readers who find our previous post, featuring an old video of a spar between two silat masters, interesting, here is a modern higher definition version featuring two practitioners of Silat Walisongo or Silat of the Nine Guardians. Again, an array of Silat techniques is on display. Though the action is dance-like and seemingly choreographed, the exponents are actually testing postures, entries, exits, counters and other techniques, sans the fisticuffs. The hard stuff comes later and, yes, Silat does have extremely violent sparring. What would a challenge match between two silat masters look like? It might perhaps look like what you see in this clip. But where is the blood-and-gore? Well, gore is not the only game in town. Grace and subtlety come to fore here. This spar is between Guru Besar Herman Suwanda of Pencak Silat Mande Muda and Pendekar William Sanders of Pukulan Cimande Pusaka. If you think this is a dance or the two masters are just fooling around, don't be too quick to jump to conclusions. 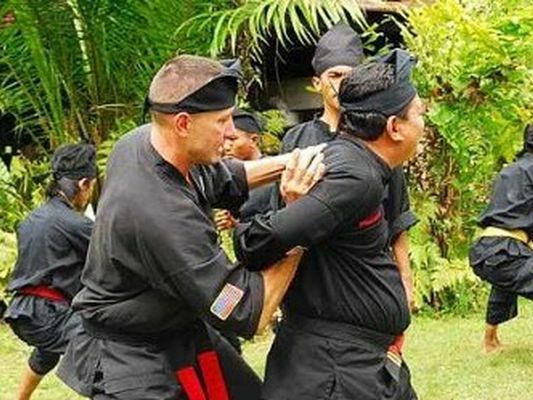 There is a large arsenal of silat techniques on display if you look closely. With this, we kick off a series on the mysterious martial art of Silat.